Probably the most prestigious award a Rookie group could have is the Best New Artist for the Golden Disk Awards. Four of the hottest female groups who have debuted this year have been nominated for the said award. the nominees are: 2ne1 from YG Entertainment, 4minute from Cube Entertainment, T-ara from Mnet, and f(x) from SM Entertainment. These rookie groups were only able to release mini album's and not a full length album (2ne1's full length album got postponed and will be released later next year) so the determining factors for the winners are Sales from their singles, popularity of course and scores from the judges (I dont know who they are). Each has their own fans and bets right? Blackjacks, 4minute, T-ara and f(x) fans each screaming for their idols to win. After reading their basis, who do you think deserves to win Best New Artist for this year's 2009 Golden Disk Awards? Which only can be won by 1 rookie group that can be won only once in a lifetime (since only one can win it and only "rookie's" can win it). If in my opinion in the sales of singles, 2ne1 debuted first compared to the other three and f(x) and T-ara only recently released their mini albums, so the competition is pretty tight. I know for some it's pretty obvious who will win but who knows? We never know do we? So vote up on who do you think deserves to win the Once in a lifetime career award. 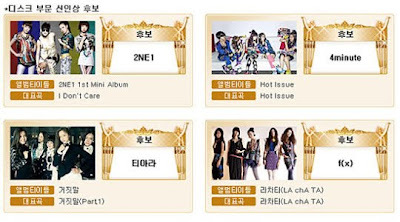 world k-pop news: [poll] Battle of the female girl groups for Best New Artist in Golden Disk Awards 2009 "clickable"
0 Response to "[poll] Battle of the female girl groups for Best New Artist in Golden Disk Awards 2009"